Luk 16:22 – 26 And it came to pass, that the beggar died, and was carried by the angels into Abraham’s bosom : the rich man also died, and was buried; And in hell he lifted up his eyes, being in torments , and seeth Abraham afar off, and Lazarus in his bosom. And he cried and said, Father Abraham, have mercy on me, and send Lazarus, that he may dip the tip of his finger in water, and cool my tongue; for I am tormented in this flame. But Abraham said, Son, remember that thou in thy lifetime receivedst thy good things, and likewise Lazarus evil things: but now he is comforted, and thou art tormented. And beside all this, between us and you there is a great gulf fixed: so that they which would pass from hence to you cannot; neither can they pass to us, that would come from thence. This was a real event, not a parable, that Jesus was describing. Hell and Abraham’s Bosom were right next to each other in the earth. They were separated by a “great gulf “. Act 2:31 He seeing this before spake of the resurrection of Christ, that his soul was not left in hell , neither his flesh did see corruption. This proves conclusively that Jesus went to Hell. Irenaeus, an early Church Father said, “…all the nations who walked in all sorts of abomination, were saved by the Lord, on His descending into Hades …”-Church Father Iraneus (a.d. 120-202) Irenaeus Against Heresies (Book I) (Full document can be found at Christian Classics Ethereal Library http://www.ccel.org. Mat 12:38 – 40 Then certain of the scribes and of the Pharisees answered, saying, Master, we would see a sign from thee. But he answered and said unto them, An evil and adulterous generation seeketh after a sign; and there shall no sign be given to it, but the sign of the prophet Jonah: For as Jonah was three days and three nights in the whale’s belly; so shall the Son of man be three days and three nights in the heart of the earth. 1Pe 3:19 By which also he went and preached unto the spirits in prison. Paradise is another name for Abraham’s Bosom because that was the place that the righteous went. Jesus and the man next to Him on the cross went to Paradise that day they died physically. Why did Jesus go there? Because He was righteous – not dead spiritually at that point. In fact He could have just gone to Heaven but He had to do this work in the lower parts of the earth. Heaven is NOT the same place as Paradise . Heaven is where God dwells and it in not in the earth. Remember, no man has ever really seen God before the cross (Joh 1:18) because they were all in this waiting place, or prison, called Abraham’s Bosom or Paradise until Jesus redeemed them with His sacrifice and blood. The appearances of God in the Bible were usually visions of God like watching something on TV but they could not really stand in the presence of the Holy God. Jesus led captivity captive by His resurrection from spiritual death. Jesus took those saints in Paradise to Heaven after His physical resurrection. That was the first time they really saw God for that was when the blood of Jesus was presented in the Heavenly Temple. At the point of the cross and from now on all saints that die(d) immediately go to Heaven, not Paradise . They will immediately be in the presence of Jesus (2 Cor 5:8) who is at the right hand of God the Father (Mar 16:19). Many teach all kinds of strange things about this phrase “first-born from the dead” because they cannot figure out what it really means. Why? Because they don’t understand Jesus died spiritually. If you know that, then this verse has absolutely no difficulty. Just read it exactly the way it was written. He is the “firstborn from the dead” period. It doesn’t make sense for this to be referring to physical resurrection for many had already been raised from physical death before Jesus (1Ki 17:17-23; 2Ki 4:32-37; 2Ki 13:21; Luk 7:12-15; Luk 8:49-55; Joh 11:43-44). Therefore, it is referring to spiritual resurrection and Jesus was the first to overcome. We follow in His footsteps if we believe in Him! (CEV) Christ died once for our sins. An innocent person died for those who are guilty. Christ did this to bring you to God, when his body was put to death and his spirit was made alive. (HCSB) For Christ also suffered for sins once for all, the righteous for the unrighteous, that He might bring you to God, after being put to death in the fleshly realm but made alive in the spiritual realm. Apparently those that translated these Bibles believed that Jesus died spiritually for how can one be made alive in the spirit if they were not before dead in the spirit? Other translations such as the J.B. Phillips, the New Living Translation, Douay-Rheims, International Standard Version, Darby, The New English Bible, The Amplified Bible, New Century Version, and God’s Word to the Nations say the same thought. Act 13:33, 34 God hath fulfilled the same unto us their children, in that he hath raised up Jesus again; as it is also written in the second psalm, Thou art my Son , this day have I begotten thee . And as concerning that he raised him up from the dead, now no more to return to corruption, he said on this wise, I will give you the sure mercies of David. Heb 1:6 And again, when he bringeth in the first begotten into the world, he saith, And let all the angels of God worship him. Indeed, Jesus the first one to rise from spiritual death. 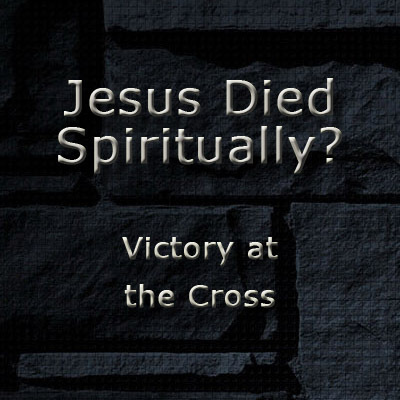 Therein lies our victory over spiritual death. We should believe in both His physical and spiritual resurrection for that is what the Word of God declares. Jesus rose from physical death and stated, “I am not yet ascended to my Father.” This shows He did not go to Heaven yet. The last part of His journey was to present His blood to the Temple in Heaven before God. Afterward, He came back to earth to show all that He rose from the dead and commissioned the believers to do the works He did. Then He ascended into the sky and was seated at the right hand of God the Father. Hallelujah to the name of Jesus, the name above every other name! He deserves glory, honor, and praise forever!! !